It is rather difficult to expound fully the factors that determined the economy of the Hellenistic period, namely the years that intervened between the death of Alexander the Great (323 BC) and the predominance of Augustus (31 BC). According to many scholars however, the Hellenistic world had ceased to exist much earlier, since 146 BC, when Corinth was sacked by the Romans, while the years that followed until Antonius' defeat are characterized as early Roman. However, as to economic structures at least, it is not simple at all to determine the end of the Hellenistic times and the beginning of the Roman predominance in the Mediterranean. For example, certain cases of progress in techniques mentioned for the first time in works by writers belonging to the period of the Roman empire may have been invented during the Hellenistic times and adopted or improved later. Correspondingly, it is very difficult to say with certainty whether some aspect of the economic life described by writers of that period, did not exist already since the 5th and 4th century BC. In general though, available information is not organized nor is it clear in relation to basic factors, such as per capita income, new wealth sources and the influence of science and mechanics in the development of economic life. Although new revolutionary ideas do not seem to have emerged, some improvements and changes have been brought about in existing structures. Among these, certain techniques can be mentioned which were applied in agriculture, industry and trade and based partly on scientific discoveries and partly on the exchange of already established methods among states of the Hellenistic world. Equally, in the organization of different sectors in economy we do not observe any radical changes, but rather a tendency to use older procedures and measures, which are adapted to new needs and are sometimes improved. This way, smaller or bigger farms are organized more effectively. The aim is not only to satisfy the needs of the owner and his family -which was the case until that time- but also to produce fine quality products and sell them. In order to achieve this, cultivation methods are improved, emphasis is given to the employment of more competent foremen in the farms, and slaves are widely used as manpower. The organization of industry seems to have taken a similar course, while trade and banking transactions were the only sectors where it is possible to see new elements being introduced. As a result, the exchange of products was carried out more easily, as it was supported by a more developed banking system. When Rome came to the fore, no innovations were registered, nor were radical changes adopted in the economic administration of Hellenic cities. The everyday life of the inhabitants and state institutions remained the same. The process of the integration of the Greek world into the Roman system, even though it began early, was intensified and accomplished in the second half of the 2nd centrury BC with the collapse of the Hellenistic states. Note: Click on the small photo to enlarge it. 01. Relief scene from the sarcophagus of Alexander the Great. Its name was given by its theme. The sarcophagus belonged to a certain king of Sidon. On its long sides there are representations of a battle between Greeks and Persians and of a hunting scene. Photo: Alexander the Great on a horseback overpowering a Persian opponent with his spear. Ca. 300 BC. 02. The Hellenistic world after the battle of Ipsus in 301 BC. 03. Since 168 BC, after the defeat of Perseus, king of Macedonia by the Roman Aemilius Paulus in Pydna, Macedonia devolved to Roman control. The Romans divided the region into four smaller administrative districts the so-called merides (sectors). 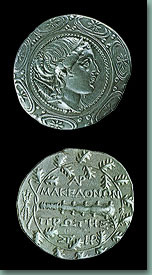 Photo: silver tetradrachm of the "first merida" of Macedonia. 2nd century BC.